CANBERRA, Australia (AP) — Australian Federal Police did not know a Bahraini soccer player was a refugee who feared persecution in his homeland when the agency alerted Bahrain and Thailand that he was on a flight bound for Bangkok, Australian officials said Monday. Australian Border Force Commissioner Michael Outram told a Senate committee he blamed human error within his own agency for a failure to email to police Hakeem al-Araibi’s refugee status in time. But Outram would not concede under questioning by senators that the 25-year-old former Bahrain national soccer team player would not have been arrested in Bangkok on Nov. 27 without the Australian tip-off. “I apologize for the error that occurred within the ABF, but I can’t say, nor can I accept, that that error necessarily led to his detention in Thailand that would have occurred anyway,” Outram said. Police Deputy Commissioner Ramzi Jabbour told the committee Bahrain and Thailand were alerted by police almost six hours before al-Araibi landed after a nine-hour flight from Melbourne on his honeymoon. 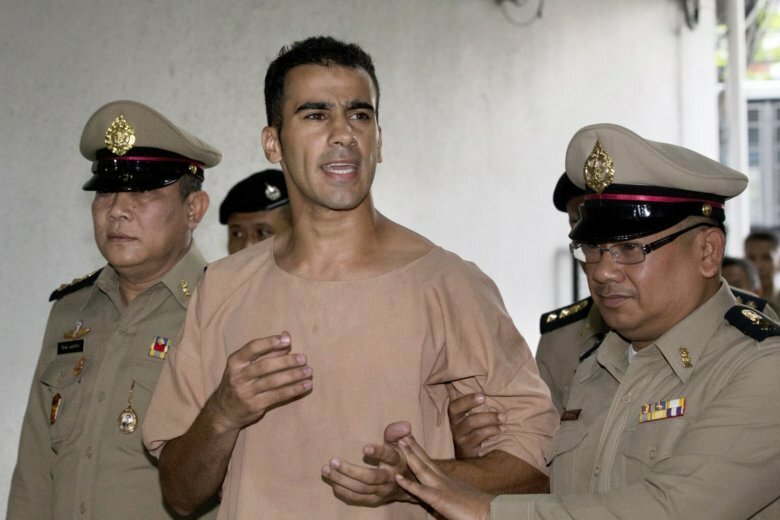 The bungle drew the Australian government, international soccer bodies and human rights advocates into a top-level dispute with the Thai and Bahrain governments to gain al-Araibi’s freedom. He was detained at the airport and was held 76 days under threat of extradition to Bahrain before he was released last week and returned to Melbourne. The rules of international policing organization Interpol prevent a Red Notice from being issued for an acknowledged refugee to be sent back to the country from which he or she fled persecution. Australian officials face days of questioning by a Senate committee this week to determine how the bungle arose. Australian Federal Police Commissioner Andrew Colvin told the committee that police did not know that al-Araibi was a refugee and did not have access to his visa status when Bahrain applied for a Red Notice to Australia’s Interpol bureau on Nov. 9. The Australian Border Force did not advise Australian police that al-Araibi was a refugee until a day after he was detained in Thailand, Colvin said. Interpol subsequently withdrew the Red Notice, but Bahrain did not drop its bid to extradite al-Araibi until last week. Jabbour said Bahrain issued the Red Notice on the same day Thailand issued al-Araibi a tourist visa. “I cannot comment as to what was the trigger” of the Bahrain Red Notice, Jabbour said. Australian law does not allow for al-Araibi’s arrest in Australia under a Bahrain Red Notice and warrant. Bahrain had wanted al-Araibi to serve a 10-year prison sentence for an arson attack that damaged a police station. The former Bahrain national soccer team player has denied those charges, which he was convicted of in absentia, and says the case is politically motivated. He said he believed he was targeted for arrest because of his Shiite faith and because his brother was politically active in Bahrain. Bahrain has a Shiite majority but is ruled by a Sunni monarchy.